Dusty Springfield number sparked her imagination. It led her on a journey of discovery finishing in a one-woman stage play - Me, Mum & Dusty Springfield. The Blackpool actor explains: " I was listening to Dusty Springfield, not that I am a particular fan, and thought what a fantastic way to end a show - with a Dusty number. First I had to find a way to get to that, I'm not a trained singer, so I started at the end and worked from there." Nor did Stephanie know much about the Sixties sensation, who in the six-year period between 1963 and 1969- had 17 UK chart entries of which 10 were top ten singles. The 1966 hit song which inspired Stephanie, You Don't Have To Say You Love Me, went to the No One slot and remained in the UK charts for 13 weeks. As a playwright and actor, Stephanie embarked on a fact-finding mission to gain her own insight into the life and career of the iconic singer who died of breast cancer in 1999. "Her life was so full of colour and incident that it gave me loads to work with," she said. The result is Me, Mum & Dusty Springfield, which comes to Manchester's Lowry Studio this weekend, starring Stephanie as Mary, a young woman who is getting ready for the scattering of her mother's ashes. The Dusty link is down to her mother's dying wish – or demand. Mary's life was filled with her mother's demands set within a world of Dusty Springfield. Not just Dusty's songs, but Dusty-like outbursts, Dusty-like drinking and finally her breast cancer. As Mary applies the thick layers of make-up – Dusty's trademark look learnt after years of watching her mother do the same – she tries to unravel the ties that bind herself, her mother and Dusty Springfield, in the hope that this final act will enable her to move on. It's a black comedy, peppered with Dusty lyrics and the odd song or two. "In a way there's something very liberating about make-up so thick, and the blonde wig, they are something to hide behind," said Stephanie, a natural brunette. Performing a one-woman show, which she has written herself, puts tremendous pressure on the performer. "The buck stops with me, there is no-one else, so it just has to be the best it can possibly be every time - that's what drives me," she said. Stephanie, who grew up in Layton where her mum and dad, Margaret and Chris, still live, was educated at St Mary's School, Blackpool. She started dancing as a little girl with the Sue Turner Dance School and then went on to Phil Winston's Theatreworks. As a dancer she got to perform in shows in every Blackpool theatre, but eventually decided to take her career in a different direction as an actor and writer, studying for a performing arts degree at University of Central Lancashire. At 33, her list of stage credits is varied from theatre performances to television. On the small screen she has popped up in commercials for Hovis and Kellogg's, plus the odd appearance in Coronation Street and Holyoakes. Now based in Manchester, where she lives with her fiance Tom Langford, Stephanie is taking Mum, Me and Dusty Springfield on the road . A hit on the Edinburgh Festival Fringe this summer, it is in Manchester at the weekend followed by dates in New Milton, Rotherham and Kendal. Her parents will get to see as many performances as they can. "They come to see me every time I am nearby," she said. Her tour will take her into May and afterwards she plans to concentrate on more writing. "I think I'm now more inclined towards writing, although I do enjoy my acting." * Me, Mum & Dusty Springfield is at The Lowry Studio Theatre, Salford, on Friday and Saturday, 7.45pm, visit http://www.thelowry.com or call the box office on 0843 208 6000. Hope you enjoy it again Carole, wonder if there will be any slight changes. Considering the musical landscape of the early Sixties that she inhabited, as well as spearheading the female contingent of The British Invasion, it is clear that Dusty Springfield is not to be taken lightly. All that being said, what we have here may in fact be one of the first acclaimed female-voiced pop albums as we would recognise it by today’s standards. Tracks on here range from the breezy to power ballads that are all subtly tinged with soul and Motown. So while she was obviously an impressive woman to be able to get her foot in the door, it is nice to know that there was a more playful side that was able to be show in tracks like ‘Mama Said’, while maintaining the artistic prestige on ‘Anyone Who Had a Heart’. While Dusty is also noted as being the voice that has become associated as the inspiration for the likes of Duffy, it is fair to say that when it comes to this there is no need to accept any imitations (especially when they choose to caterwaul quite a few of their album tracks). While I am quite aware that Dusty In Memphis was meant to be her masterpiece, I would have to admit that this album comes mighty close to that status. In A Girl Called Dusty there is a nice variety of songs - granted they are all covers - but still there is plenty of variation in the material that she has decided to include. This is rather refreshing for this era, something which is now expected of major artists, since major albums could be made with little variation around the theme. Dusty, however, is here standing on her soapbox in her high-heels (due to being 5’3’’) and is proclaiming to the world that there is now a woman on the scene and she can play this pop-game better than any of the boys. The production values here are also something to be noted. The productions here resemble Phil Spector’s Wall Of Sound technique, but are slightly muted in comparison as a means to completely showcase Dusty’s vocals. This can be witnessed on ‘Will You Love Me Tomorrow’ where she sings as clear as a bell over layers of strings, percussions and backing singers. This is an album that is truly knee-deep in classic songs. I would actually challenge anyone to go through this album and not recognise at least 3 songs from this, my personal count was six. When you listen to songs like ‘Wishin’ And Hopin’’ and ‘Twenty-Four Hours From Tulsa’, and then consider that this was actually a debut, this effort becomes so much more laudable. Through looking at the song choices her on this album, the image that is portrayed is a proto-feminist who will not be tied down and demands to be treated as she would want to treat her partner; as such she remain her own woman (‘You Don’t Own Me’) while still advocating smothering your lover with affection to show that you care (‘Wishin’ And Hopin’’). Not so bad for a girl called Dusty is it? I still remember the first time I heard Dusty in Memphis . It was closing time in the music shop I worked in. A colleague grabbed an album from the easy listening section and told me that I needed to hear it. Initially dismissive of a singer best known for the overplayed Son of a Preacher Man , there was something about opening track Just a Little Lovin’ that was immediately spellbinding. Thats a nice little snippet Clive. Thank you. quote] Essential listening ? undoubtedly . LM. Couldn't agree more..
Definitely a sweet tooth amazing selection here, hope no one's on a diet. Thank you for the link Carole, lovely pic of Dusty. Yes...Some of those stars are eerily alike...I LOVE the way Dusty keeps popping up in mags, newspapers and radio!! Ta for the link, Carole, most interesting. Dusty Springfield is one of the latest British pop singers to invade France's Tin Pan Alley. In her EP "Mademoiselle Dusty" (Philips (21) BE 12579) she sings Demain tu pewc changer ("Will you love me tomorrow"); L'Ete est fini ("Summer is over"): Je no peux pas t'en vouloir ("Losing you") and Reste encore un instant ("Stay awhile"). She is ably accompanied by The Breakaways, whom she coached in French, and the backing by Ivor Raymond and his Orchestra is also first class. This EP is a successful reply to the challenge being issued lately by her French rivals of the Entente Cordiale. I met DUSTY SPRINGFIELD in 1963 on the BBC TV show Top of the Pops, when I was promoting It's My Party. Her talent was obvious the moment she opened her mouth--a sound so unique that she could take someone else's song and make it her own. She sang live with the band and sounded totally awesome. I lip-synched and felt somewhat foolish. Our paths crossed again in Los Angeles in the '70s. We both enjoyed watching women's tennis and developed quite a friendship. She was very bright, with a great sense of humor. When she recorded a song I wrote, Love Me by Name, Dusty knew exactly what she wanted. She handpicked the musicians and worked with the arranger for weeks. When she went into the vocal booth, put on the headset and closed her eyes, she reached down into the depths of her soul and made magic. As Dusty is wailing and the record is fading she ad-libs two little words: "sweet baby." She reserved this phrase for songs she most loved. It was the Springfield seal of approval. It's sad that she should pass just before she was to be inducted into the Rock and Roll Hall of Fame. But she'll be there, I'm sure, so the rhythm section had better be tight. Dale Winton played "am I the same girl" on radio 2 this afternoon. The Lana Sisters' song Buzzin' is available for download next month, but no mention of a CD release. I can't make out Dusty's voice in the sample clip though. "Best Songs Considered"..."Best Opening Tracks"
Clive wrote: The Lana Sisters' song Buzzin' is available for download next month, but no mention of a CD release. SweMaria wrote: Thank you so much for that link! Some, are available to LTD members via charity donation (to the Hospital that looked after Dusty when she had cancer--The Royal Marsden) and include: Dusty as DJ 79 and 89 (2 discs) where Dusty plays her favourite music. Also there's A Very Fine Love radio promos from 1995 (2 discs); The Saturday Sequence, 1989 and The Dave Cash Show and "Be My Guest" Dusty talks to Emperor Rosko 1970 (together 2 discs). Several people helped to provide this material for fans, including Carole G and Jen in Canada. I think Rob has these CD's for distribution or even closer to home it's possible that Cor can provide them. Happy listening to Dusty! Last edited by Kathy on Tue Jun 08, 2010 1:15 pm, edited 1 time in total. Liz, a couple of years ago Jen finalised some of these tapes for us and they were offered through LTD team members in various countries. In the US it was Paula, in Oz it was me (but I lost the ones I had on the hard disc on my computer when my machine crashed in January this year, luckily I still have the original discs! ), in Europe it was Cor. At the time there was only a modest call for them as I recall and I think they are a much under utilised resource and great for listening to when doing the ironing, or to brighten up a rainy day! There's heaps of information on them. I think that Rob probably has these recordings available and so it's worthwhile to email him in the first instance. Perhaps he could offer them as CD's of the month! I will be happy to make and send copies of these CD's if people want them (after September when I am free from the court proceedings, please), but prefer to get the team member nearest to do this to minimise postage costs. THANKS KATHY, HOPEFULLY ROB WILL BE ABLE TO DO THEM THEY SOUND GREAT. I LOVE HER VOICE SINGING OR SPEAKING. ALL IN A GOOD CAUSE TOO. I'll ask my "Swedish Dustyexpert" Corinna when I meet her on Sunday . Maybe she knows what I have to do to get these CD's. I think it's your lucky day, Maria! now I wish I was coming to visit on the weekend then I would be maybe have a nice treat in cds?? Anyone spotted this book around anywhere? I'm wondering what Dusty story he has to tell. daydreamer wrote: Anyone spotted this book around anywhere? I'm wondering what Dusty story he has to tell. In the course of duty [hosting TV series], they [Mike & Bernie Winters] naturally ran across other famous people, and Mike's anecdotes are so surpassingly banal they possess a sort of poetry. Mike glimpsed Sean Connery on the stairs and saw Bob hope in a corridor. 'Hi Bob,' said Mike. 'Hi there,' said Bob. He met The Beatles and 'Jane Asher was carrying Paul's guitar'. My favourite moment is when Mike encountered Dusty Springfield. 'I never found out why she called herself Dusty,' we are told. I also Googled and came up with that same result and nothing else. As the reviewer at least says the Dusty encounter is his favourite, I'll check out Waterstones and see if they have a copy to flick through. I just came across a piece about George Galloway writing a script for a Dusty musical. Everybody seems to be at it! FORMER East End politician George Galloway could soon be rivalling Andrew Lloyd Webber - by penning a musical. The ex Bethnal Green and Bow Respect MP said that amongst the projects he's working on is a musical about his musical heroine Dusty Springfield. Mr Galloway was unsuccessful in his campaign to win the new parliamentary seat of Poplar and Limehouse after pledging to only stand in the neighbouring seat for just one term. Since then he has been working on a number of projects and continued his extensive tour of speaking engagements. Writing in his Daily Record column Mr Galloway reminisced about his musical influences. He said: "The star who shines brighter than all the rest on this trip down memory lane is Dusty Springfield - as fresh today as a spring field should be. And, as it happens, one of the many projects on which I'm working - with Scots writer Ron McKay - is a stage Musical, eponymously entitled Dusty." He is also planning another trip to Hollywood to discuss a film project and said film director Oliver Stone is interested in it. He jetted off to Tinseltown just after May's General Election for talks about making a documentary about the situation in Gaza. Mention of Dusty here, sorry if we've had it before. Dale played Goin' Back on Saturday on Pick of The Pops. anyway they played IOWTBWY as the advert went on and then this morning Brian Matthew on S.O.T.S. radio 2, after about 7 weeks of not playing any Dusty , featured her on the E.P. spot with " every day I have to cry" nice to hear this for a change and my only complaint is that unusually for him he did a "Steve Wright" and talked over the end of her song as he faded it out. 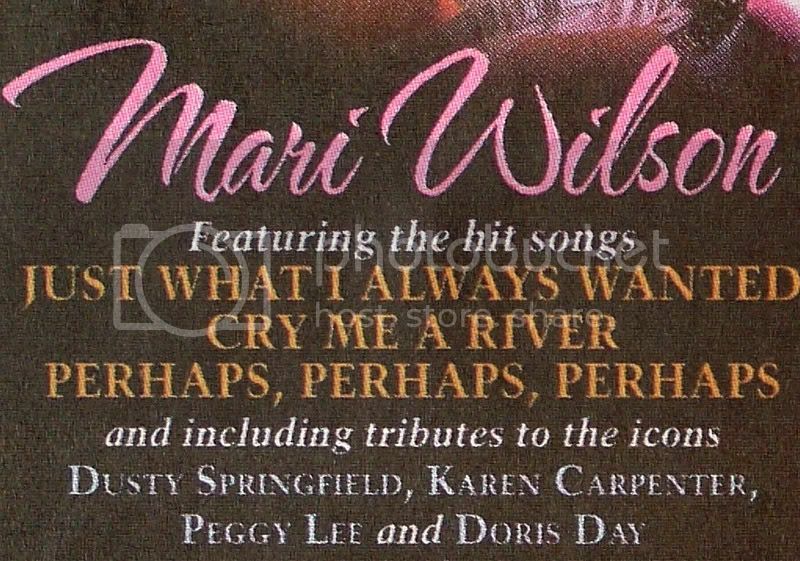 "The entire collection revolves around the song The windmills of your mind by Dusty Springfield...the lyrics are translated into colors: warm gray, black, white and beige"
Just looked at Rob's initial post on this thread - With the Guardian ad for Mari Wilson. A reviewer said, "Copy cats Amy Winehouse and Lily Allen pale into insignificance as audiences hear the real thing." Is she really that good? If you mean is Mari a good singer Michael, then yes she is. If you mean does she sound like Dusty, then to me, no she doesn't! Others may disagree. As Clive was on a fashion topic, I wondered if any of our Stateside members have ever heard of the Dusty of California clothing range. The founder is a fan and has named her ranges Dusty for the guys and Cameo for the ladies. Well I'm not 'Stateside' (as you know)Carole, So, I never knew about this clothing range. Thanks for the fashion 'snippet'...very interesting. Carole - Do you think that Mari Wilson is a much better singer than both Amy Winehouse and Lily Allen, as the reviewer suggests? just been told that Dusty was a question on University challenge, dont know what the question was, they didnt know the answer must have been from University flintstone. Just seen University Challenge Liz. The question was who sang 'If You Go Away'.Three short versions were played the first two were by Tom Jones and Scott Walker. The third was dear Dusty. The team after much discussion came up with Nancy Sinatra.!!!!!. good grief, it makes you despair,is there no hope for the youth of today actually knowing its own best musical history. well at least we now know that Rumer has said she was influenced by Dusty, so thats something. Love the bit in the Telegraph yesterday when Henry Winter was commenting on Fabio Capello's apologies for the world cup. Winter said...yesterday Capello apologised to the fans but heaped criticism on the players.at one point,he almost turned into Dusty Springfield with his lament about "I just don't know what to do". Not with himself. With the players. Dusty and Cameo clothing lines -- fascinating. Now who among us could wear those garments? Even Laura has passed size zero these days. 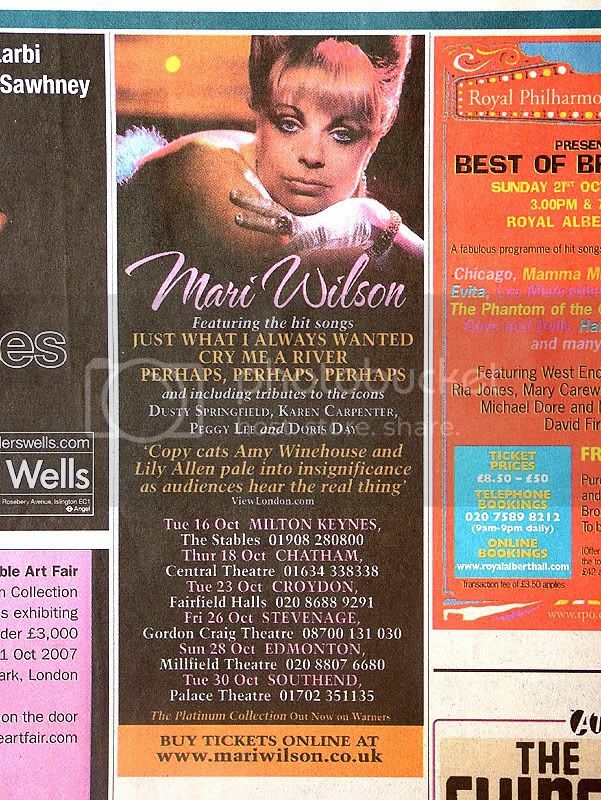 @Carole G -- did you see the Mari Wilson thread from last week? thanks Carole,lovely to see a new one of Dusty. I must admit I didn't know Bill Parkinson, I wonder who is the other lady in the photo with them? Heres the pic for you! Thank you Cas I'd a feeling you would sort it! Dusty's Sweet Ride is included in this forthcoming CD collection of songs written by Lee Hazlewood. Not sure which version they have used. Do you think that singer Duffy bears an resemblance to Dusty? Nope not at all, do you? They're both blonde, but I guess that's all! It's always good to see Dusty mentioned in magazines outside the UK, though. So good find, Christoph! Yes a nice find Chistoph, but no nothing like our Dusty. thanks Christoph but I agree theres only one from that mould. anyone familiar w/ Peter Miles?...a nice little article on his relationship w/ Dusty in earlier years & it looks like a duet from 50 yrs ago is to be released...not much info on when. A JAZZ singer and actor who duetted with Dusty Springfield is to have his track released by a major record company, more than 50 years after they first sang together. Peter Miles, of Bradley Gardens, West Ealing, was a close friend of hers while in their late teens and often used to visit her at her home in Kent Gardens, West Ealing. He met the star through her brother, Tom, after he joined him in a four part male voice choir. He said: "We used to sing a lot in her kitchen, me and her and Tom and the two other guys. "I think Dusty would have agreed with me that she was always insecure, I never knew why that was. She was always a perfectionist, would always say she hadn't done it well enough even when top musicians and producers would say it's perfect. "But she wasn't as demanding before she was famous. We rehearsed it at her home and it only only took one or two takes and she said we'd got it. She was very professional even then. "We recorded it in a studio in Queensway which was cheap but still good, it doesn't exist any more. I did spoken ad-libs between some of the lines – she'd sing 'who's to blame' and I'd say 'mostly you' and she'd give a little laugh. "She loved comedy, she and her brother had a great sense of humour, the more ridiculous the better. "They were both very introverted, private people. What you saw was what you got with dusty. If she wanted to be quiet, she was quiet, if she wanted to be witty, she was witty." Dusty's and Mr Mile's duet is part of a rarities disc to be released by Universal in January. The timing could not be better for Mr Miles who has become a successful jazz singer and who works with top musicians after years of hard work perfecting his style. It follows on from 25 years as a professional actor, playing parts in well-known shows like Doctor Who. He added: "I've been a jazz singer for 15 years and I'm playing in top clubs and now getting great feedback from musicians and others." As for Dusty, he says she was a big part of his life and still has clear memories of their friendship. He said: "I have a picture of Dusty in my mind sitting in her sitting room at home. It was her last year at school, an RC convent school in Northfields, and she still had straight red hair. She was day dreaming staring at a magazine on the floor. It was about America and I thought 'she's hooked'. She had a thing about America. "It's difficult to say the last time I saw her, I think it was in Liverpool in 1967. I was in a play at the Liverpool Play House and she was down the road at the Empire. I went to the door and said I'm a friend of Dusty's, a real friend from Ealing. "We gradually lost contact, I'd become a busy actor and she had become famous. "I suppose I took it for granted that I'd known her so well for so long but I guess there aren't many blokes who have sung with Dusty." Peter Miles next gig is at the Bull's Head in Barnes, with the Duncan Lamont Quartet. Interesting to read about this man's musical relation to Dusty and her brother in earlier years. Thought this could go here. Saw it whilst looking for something else. Don't ask me the year, someone with a good memory, or the patience to look it up may know! Clive wrote: Dusty's Sweet Ride is included in this forthcoming CD collection of songs written by Lee Hazlewood. The liner notes on this new CD mention that despite many Dusty compilations Sweet Ride remains fairly hard to find.I wonder why it is featured so seldom? Cas19 wrote: Thought this could go here. Saw it whilst looking for something else. Don't ask me the year, someone with a good memory, or the patience to look it up may know! What is she doing ? Looks like she's reading something she's written on her wrist. Anyone have any info on this one.? Well Remembering Dusty Springfield was a four parter on R2 in 2000. Not sure where you spotted this Karen, could be official, but it sort of looks like a home made copy of the series. Fraser did something similar at the time that it was broadcast. I've added this to our A Song For You section. Rob should have a copy of this one, unless he says otherwise! Thanks for that wonderful piece of art Karen! Melts in your mouth. Not in your hand ! They look really good don't they, are they a bit like a Smartie? Yes Cas! They were called Smarties when I was a kid but all I can find now are M&Ms. But it's the same - chocolate covered with sugar coating. Yummy. No Liz won't be eating them will probably stay in my fridge , too good to eat , thanks for bringing them round , and once again thank you Cor for letting us have them. I found this when looking for articles on Tito Burns. I can't recall seeing it before, but sorry if its been on the threads already. You search for one thing, you find another...! Certainly had a piece of two of new info for me, Cas. Thanks for posting! You could be forgiven for thinking that New Yorker Nell Bryden’s album What Does It Take? is a reincarnation of Dusty Springfield. There’s the platinum blonde hairdo (no beehive, though) and the cover art is a deliberate throwback to the vinyl covers of old. A couple of the tracks sound like our Dusty as well - and no one could take that as an insult. The second song, Not Like Loving You, could be Springfield singing a Ray Charles number. However, Bryden soon shows she’s made of sterner stuff than a mere channeller of a great and dead diva. Three tracks in and we have Where The Pavement Ends, an driving he-done-her wrong acoustic country ballad which shows off Bryden’s strong and clear vocals. Against an acoustic guitar and bass and snare drum she intones such memorable lines as “His hands were fast his words were sweet”. Helen’s Requiem is the sad tale of a churchgoing girl who is found dead in her lonely home. This is a song which would not have gone amiss on a Bonny Raitt album. Bryden comes from a interesting background. Born in Brooklyn, her father Lewis is a prominent landscape painter and her mother Jane was a classical soprano who sang in Carnegie Hall. Blessed with a vivid imagination - and this comes across in the rich variety of characters she conjures up in her songs - Nell was turned on to rock and country music by the records of Janis Joplin and Jimi Hendrix. You can still hear Janis’s influence - that strength with more than a hint of vulnerability - on Second Time Around. And the retro artwork is there for a purpose - Bryden is a bit of a magpie when it comes to influences and there is even a nod to the vaudeville flapper era, complete with strummed banjo, on the last track, Late Night Call. This is a mainly buoyant collection of songs. Bryden comes over as an open and sunny personality. She sure can rock, and to quote Gram Parsons, she sure can sing as well. It’s released on Cooking Vinyl by Shock Records and is in stores now for $29.99. I must admit to having not heard this lady sing...will try and do so. The comparisons to Dusty are in some ways a compliment but also annoying too. There will only ever be one Dusty and modern singers very rarely come close. By the way those M & M's would not have lasted 2 minutes had they been in my house!!!! CaroleG, great review. I just listened to Nell Bryden on YouTube and agree with you on the parallels with Dusty. She's a real singer (the slip I saw was live, just NB's voice and her guitar) who isn't afraid to sing without all the electronic stuff that often allow the singer to cover up all manner of offenses. Thanks for mentioning her! Not heard of her I will look out for something by her.